If you think you can gain an advantage by way of sequential or conditional probability (ex. after eight successive Blacks you bet Red because Red is more likely to come), try this two-way Roulette betting test on the 'even money' bets. First wagering flat bets and then, in another test, wagering progressive bets, as explained below. You don't need to risk money. On your next visit to the Casino write a list of outcomes of say 100 or 200 spins of actual play at a Roulette table and try it out at home. Or, play free Roulette online. First, bet against the outcome, that is, if Black comes up bet Red, if Red comes up bet Black. Bet every spin. Do the same with ODD/EVEN and HIGH/LOW, simultaneously. Then, using the same list of outcomes, do the opposite. Bet with the outcome, that is, if Black comes up bet Black. Keep betting Black until Red comes up then bet Red until Black comes up and so on. Bet every spin. Do the same with ODD/EVEN and HIGH/LOW, simultaneously. Compare the two results. You should find the results to show little difference in profit and loss between the two methods. If you try the same test on different lists of outcomes, you should find that the profit fluctuates: sometimes betting against the outcome is profitable and sometimes it is profitable when betting with the outcome. 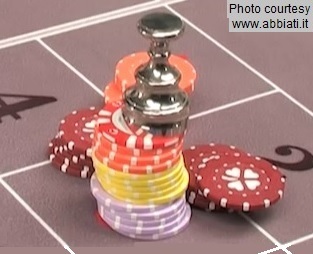 Now, try the same test as explained above but this time each time you lose you double your bet, up to five times, starting with a single-chip bet, that is; 1 then 2 then 4 then 8 and then 16 chips. If you lose on your fifth attempt with 16 chips, you start with a single-chip bet again. Each time you win, you start with a single-chip bet. Compare the results. You should get similar results in profit and loss to the flat betting test above. 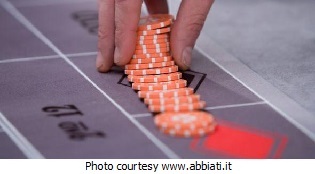 Two major factors determine how much you win or lose playing roulette. By managing and controlling these two factors, you can generate an advantage that in the long term can make you a winner and keep you ahead of the casino at all times. Find out what these two factors are and what makes a winning system, in the main strategy page titled Winning at Roulette. Interesting facts, tips and a system. Note: This page should show on kanzen.com domain (see the http:// or www. at the top of your browser). If you are caught inside a 'Frame' of another domain, click here to break out. Copyright © Jacob Kanzen See copyright notice.